DalCard is your student’s official Dalhousie identification card, library card, debit card for select goods and services, laundry card and access card for residence. Avoid lines in September: Have your student submit their DalCard photo online by August 27. Put money on the DalCard: Your student gets 5% back on purchases made with the DalCard at the Dal Bookstore and select food vendors on campus and off campus. Add money to your student’s DalCard. Have questions about starting at Dal? Find all the answers on the New Student Orientation Website including a checklist, helpful tips, info about life on campus, and more. 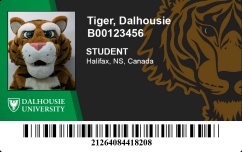 DalCard is your official Dalhousie ID, your library card, a debit card for select goods and services, your dining hall pass, and—for many students on our Halifax campus—your access card for locations around campus, including your residence. Be sure your DalCard is ready when you arrive by submitting your photo and depositing funds online. More than 10,000 DalCards are produced each September. New students can save time and avoid long lines by submitting a photo ahead of time. Upload your DalCard photo now. Money on your DalCard can be used for books, meals, and even laundry and printing services. And, best of all, every time you use your DalCard at the Bookstore and other participating vendors, you'll get 5% of the value of your purchase back on your card. Learn more at DalCard Explained. Online: See Make a Deposit. In person: Halifax - the DalCard office or several other locations on campus. Truro - the MacRae library and the Bookstore in the Cox building. By phone: Call us at (902) 494-2334 or toll free at 1-855-376-0330 with your credit card information. We accept Visa, Mastercard, and Amex. Parents: You can make a deposit online, too! Want to help your student buy books or give them some extra money to eat out? You can deposit money directly onto your student's DalCard. It's easy to do. All you need is your student's Dal ID number (B00xxxxxx) and date of birth. Visit Parental Deposit to begin.